Day 6 – A ‘Wheely’ Good Day! Aaron has finally got the PiTFT screen to work! After installing a collection of drivers on a fresh version of Raspbian, the screen is fully functional. The touch feature of the screen also works, but will need some calibration. Aaron is now working on setting up the Raspberry Pi as an access point. He was successful, however our school network disabled the Pi. We are awaiting the IT staff to allow the IP and MAC Address. Aaron will continue to work on setting up the PiCamera at home. Ryan continued to learn Python. He has created 4 Python programs – one to reverse a string, one to remove vowels from a string, one to calculate the scrabble score of a word and one to censor a single word anywhere in a string. Mostly useless programs, but a great way to learn Python. Matthew and Riley have attached all four wheels to the robot and have 3D printed 2 standoffs to support the screen. As we are using a different Raspberry Pi, these default standoffs do not support the screen properly, so we shall design our own “Y” standoffs next lesson. Riley and Ryan stayed back after school. Ryan continued his Python course on Codecademy. He is now 75% of the way through the 13 hour course. 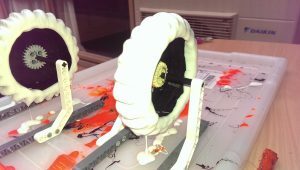 Gerard Elias and Riley went outside to plasti-dip the four wheels. 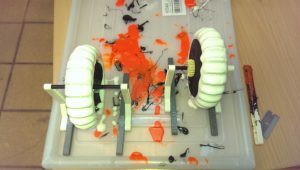 They were dipped in a rubber paint solution, and dried overnight, solidifying into a solid rubber layer on the wheels. This rubber layer increases the grip of the wheels.